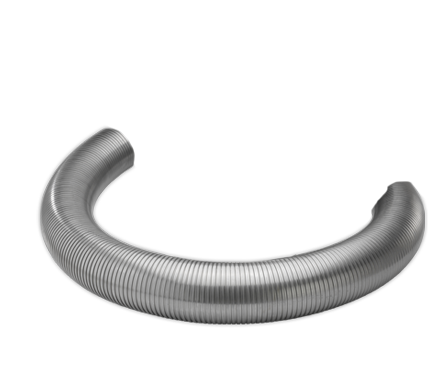 T-REX™ (Roughbore) is Hose Master’s torque resistant stripwound metal hose with enhanced sealability. T-Rex™ provides resistance to twisting, unwinding, and metal strip flare-up when cut. Example: RX15SS is made from T304 stainless steel strip.015” thick. 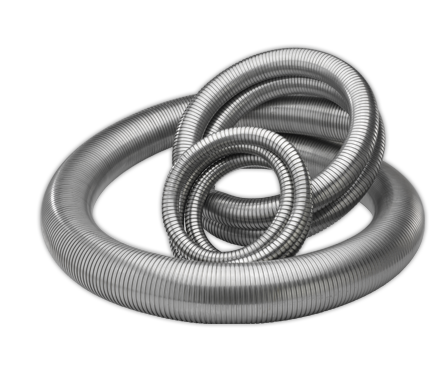 Interlocked metal hose, by the nature of its construction, is not pressure tight. 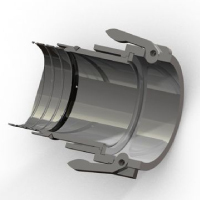 However, pressure and media infiltration through the interlocked wall can be minimized by the insertion of one of a variety of packings into the wall during hose manufacturing. Packing consists of a continuous cord or strand of elastomer, or other material which is locked into a special channel between the interlocked hose wall layers. The choice of packing material is tailored to the demands of the specific application. T-Rex™ Swivel Part D coupler consists of a light-weight aluminum body with a stainless steel insert. It is available either factory welded directly to the hose or field welded using a weld ring (the additional weld ring allows the body and insert to be reused). All other standard industrial and custom fittings are available upon request. Please contact Hose Master’s Customer Service Department for details. Hose Master places emphasis on continual improvements within our manufacturing processes, product offering and services. Hose Master reserves the right to make changes without further notice to any products contained herein.